Bad tempered delinquent, Kylie Bucknell (Morgana O'Reilly), is forced to return to the house she grew up in when she is placed on home detention. This punishment is made all the more unbearable by the fact that she has to live there with her mother Miriam. Unable to go beyond the front gate, she has to wait for hours on end to use the telephone - all the while listening to her mother’s ludicrous theories that the house is haunted. Kylie initially dismisses her mother's superstitions as nothing more than a conscious distraction from a life occupied by boiled vegetables and small-town gossip. However, when she hears strange noises she, herself, begins to wonder if the house is possessed by a hostile spirit. Horror comedies are hard to get right. Often these films are just not funny enough or just not scary enough. Sometimes they are both. Housebound, a low budget film from Kiwi filmmaker Gerard Johnstone, manages to get this tricky balance just right. The film started off as an idea that amused Johnstone. In an interview with FlicksTalks, he explains that his initial concept was to explore the comedy in having “the worst daughter in the world being stuck on home detention with the worst mother in the world”. This situation certainly makes for many offbeat, laugh out loud moments in Housebound. O’Reilly has wonderful comic timing (her facial expressions and reactions are priceless) and Rima Te Wiata’s performance as Kylie’s mother Miriam is brilliant. On top of this dysfunctional mother and daughter relationship, the house they live in is haunted - placing the movie squarely in the horror genre. The horror elements of this film did not come easy for Johnstone. Before starting work on Housebound, he watched all of the of horror classics. He wanted to work out how films in this genre work - how horror directors build tension and atmosphere. Johnstone admits that Housebound isn’t the scariest film in the world and this is true. This movie isn't likely to keep you up at night. However, it is unsettling, it is full of suspense and it contains a pretty healthy number of jump scares. In addition, Housebound is enjoyable fun from start to finish. I loved this movie. I laughed, I jumped and I was completely engaged by the film’s wonderfully suspenseful story. Importantly, I cared about what happened to the central characters. Often in horror films (and comedy horror films in particular), I find that I don’t really care about the people involved. Not so with Housebound. For all their faults, I really liked Kylie, her mum and Amos the endearing security guard. I also loved the way that Housebound keeps you guessing as to how things will play out. Will this be a supernatural story or is something else going on? For quite some time I really didn’t know who to trust. And that is a very good thing. The film then twists and turns before it reveals its dark truth. When the credits rolled I was grinning from ear to ear. I had really enjoyed myself... so much so that I can't wait to watch Housebound again. Housebound was made on an extremely low budget. The film was funded through the 'Escalator' scheme, an initiative created by the New Zealand film commission. It is funny to think that the last film that I watched from New Zealand was also a horror comedy - What We Do In The Shadows. 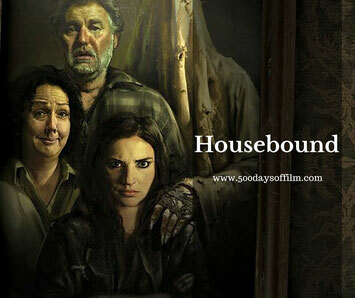 Have you seen Housebound? If so, what did you think of this movie?